FORT MYERS, Fla. -- It’s been raining quite a bit in Southwest Florida, which means more cane toads are roaming around the area. The scary part is the nasty creatures can kill your pets. “I can pick up 200 to 300 in an evening, without a blink of an eye,” said Ray the Trapper. Ray the Trapper catches wildlife in Southwest Florida. Lately, he’s been busy catching cane toads, also known as bufo toads. The problem is the toads are highly toxic and can kill your dogs. “If a smaller dog picks the toad up and secreted the toxin, it wounds up on their lips or mouth,” said Ray. Ray said the toad can discharge a white milky poisonous substance, it’s sticky like peanut butter and clings to a pet’s mouth. If a dog licks, bites or picks up the toad, the toxin can attack their nervous system within minutes. Symptoms can include drooling, seizures, loss of coordination and death. 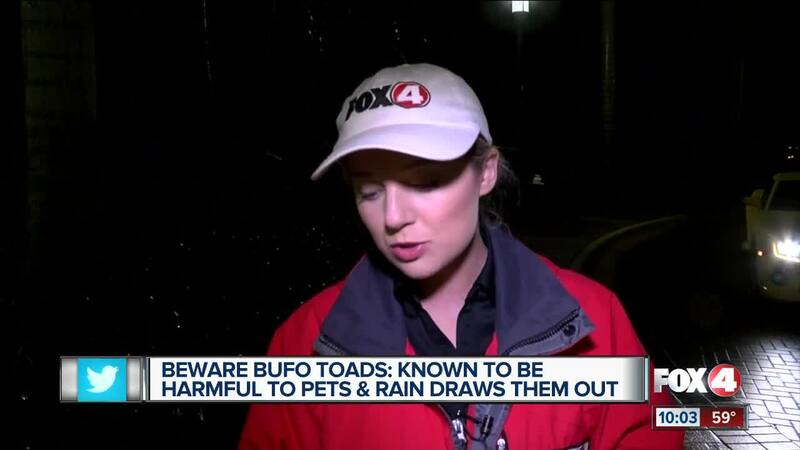 Ray said pet owners need to beware because there are a lot more toads when it rains. You can find them everywhere, especially at night. Pet owner, Chad Wong said he keeps a close eye on his dog Chewie for this exact reason. If your pet licks one of these toads, flush their mouth out for 15 minutes and immediately take them to the vet.